Enter your location to find a family law attorney close to you. See local family law attorneys in your area. An Orange County family law attorney can be used to help solve your divorce, child custody, and family law issues. Child custody and visitation are some of the most complex issues in family law. Talk to Orange County family lawyer, Bruce Bridgman, to learn more. Are you involved with divorce, custody, visitation, guardianship, adoption, or another family law issue? Facing any type of family law matter can be difficult, to say the least. You may be dealing with a complicated legal situation where your financial stability and your relationship with your spouse and children are on the line. Whether you are faced with a divorce or child custody dispute or are interested in adoption, a skilled family law attorney can provide you with knowledgeable guidance and much-needed legal protection. We created this directory to not only provide you with helpful information about the complex field of family law but to help you easily find the right legal professional for your case. Visit our Family Law Information Center or take a moment to read some of the blogs or articles posted by the family law and divorce lawyers listed in our directory. To find an attorney, enter your location or conduct a search by legal topic and we will provide you with a list of lawyers in your area that may be able to assist you. Click here to find a family lawyer near you. Going through a divorce can be a highly emotional and stressful ordeal. Decisions regarding spousal support, child custody, parenting plans, and property division are only a few of the weighty factors which have to be finalized. The team at Givens Divorce Law Group understand that you are carrying those burdens and they want to assist you and through the difficult and tedious process. 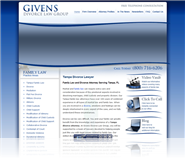 The accomplishments and awards given to Givens Divorce Law Group are impressive. They are AV-rated by Martindale-Hubbell and are also Board Certified by The Florida Bar; beyond this, they are associated with Super Lawyers and have been included in The Best Lawyers in America for over 10 years. In addition, they were rated in the Best Law Firms for 2011 and 2012 by U.S. News Best Lawyers. They have received these honors because they have proven their dedication and care for their clients; they want what is best in each individual situation and are supportive and compassionate to their clients. At Givens Divorce Law Group, the team handles each individual case with diligence, compassion, and commitment. They believe in providing their clients with legal help that is reliable, dedicated, and consistent. They will explain to you the various options available to you and answer any questions you may have. Divorce can be complicated, and you don't want to make decisions hastily or without understanding the implications they may have. If you are going through a divorce, it is imperative that you seek the help of a Tampa divorce lawyer who will handle your case with not only competence, but also compassion. The team at the firm understands that family law related issues can be highly significant to the divorcees, and they will do their utmost to explain to your options and assist you in the decision-making process. Do not hesitate to contact the Givens Divorce Law Group today and learn more! What do I own and owe in regards to a divorce? HOW MUCH MONEY DO I NEED TO HAVE TO GET CUSTODY OF MY CHILD? Is My Spouse Hiding Assets During Divorce? What Is Child Support and Who Is Entitled to It? What To Know About Divorce in New Jersey? Alimony - Can Adultery Affect Divorce and Alimony?